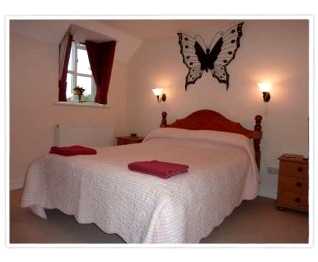 The cottage provides accommodation for up to five persons and is a wonderful base from which to explore the Cotswolds. A double bedroom on the ground floor. 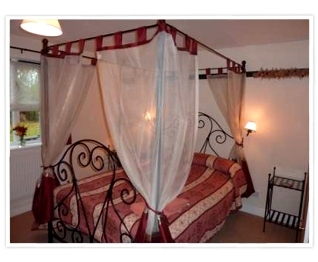 This room features an impressive iron 4 poster bed with coordinated drapes. It has En-Suite shower and WC, a flatscreen digital TV and tea & coffee making facilities. A double bedroom on the first floor. This room has a double bed with En-Suite shower and WC, a flatscreen digital television and tea & coffee making facilities. A family bedroom on the first floor. This room has a double bed and single bed with an extra pullout bed for a fourth person. It has En-Suite shower and WC, a flatscreen digital TV and tea & coffee making facilities. A studio apartment in a seperate ground floor room outside the main house. 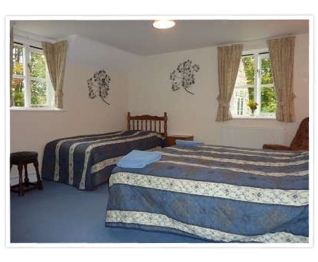 This room is a twin room with a double bed settee accommodating up to five people. It has En-Suite shower and WC, a flatscreen digital TV and Video, it aslo has a small kitchen area with microwave, refrigerator, tea & coffer making facilities and table and chairs. The kitchen are is suitable for light user like heating baby’s bottle, not for preparing meals. Outside is a patio area with outdoor seating. There is also a small lawned garden.